The foundation of your home needs to be strong, but sometimes, foundations can start to crack, tilt, wear down, or settle in ways that simply don’t support your home. When this happens, you need a residential foundation repair, and that often includes adding new supports. 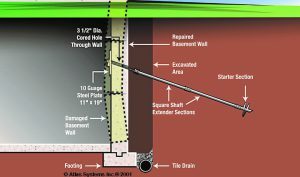 At Atlas Piers, we offer a variety of home foundation solutions that are designed to perfectly meet the unique requirements for your home repair project. You may need a foundation repair if the consistency of the soil around your house has changed, if your home has settled crookedly, or if water damage has started to weaken your foundation. In some cases, the first signs that you need a foundation repair are cracks in your foundation, but in other cases, the first signs may happen inside your house. That can include doors that are hard to shut, windows that don’t shut, sloped floors, bowed walls, or wet basements. 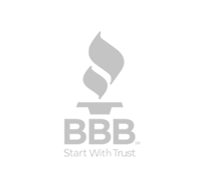 If you’re not sure, contact us to set up a consultation, and we can help you assess whether or not you need a repair. To protect your home’s foundation, always try to direct water away from your home. That requires gutters but also landscaping that slopes away from the home. Also, schedule timely repairs. If something appears to be wrong with your residential foundation, contact someone to fix the issue while it’s still small. Don’t wait for it to get larger and more expensive. Luckily, there are a variety of solutions that you can use to fix your home’s foundation and give new support to your home. Some of these fixes even allow you to add more weight (such as a another story) to your home. 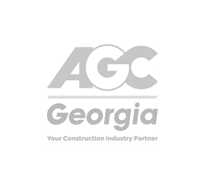 Below are some of the most popular solutions and products in our portfolio including helical piles, resistance piers, helical slab piles, and helical tiebacks. If you want an overview of those these products work and a look at their benefits, continue reading. 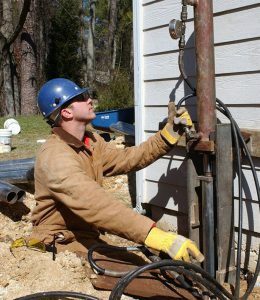 Helical Piles consist of a shaft fabricated from either solid steel square bar or tubular steel. 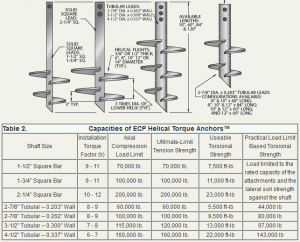 Welded to the shaft are a series of helical plates. The plates vary in diameter from 6 inches to 16 inches and typically have a thickness of 3/8 or 1/2 inch, depending on the application. The standard lead shaft length of most products are 5 feet and 7 feet; however, other links may be specifically fabricated for specialized applications. 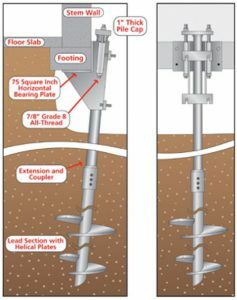 Helical piles are considered deep foundation elements. 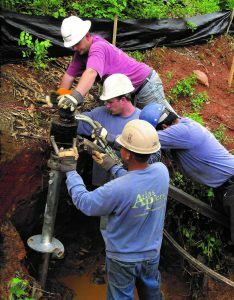 They are usually installed into the soil to an average depth of 22 feet in the Piedmont region. Extensions of various lengths are available and are supplied couplings and hardware for attachment to the lead section, allowing the helical pile to reach the desired depth. 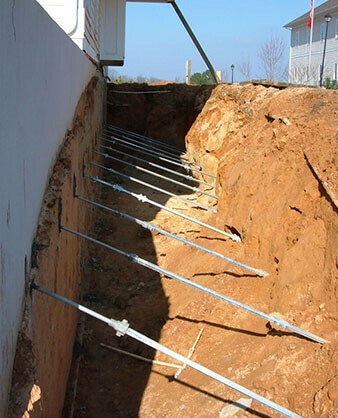 between the helical pile and the foundation footing or slab. 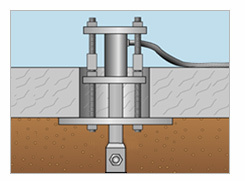 This allows for the transfer of the load from the foundation, through the questionable soils into the helical pile. Resistance Piers. Atlas and ECP Resistance Piers belong to the family of underpinning products that are sometimes referred to as micropiles, push piers or pin piles. These underpinning products are hydraulically advanced vertically into the soil using the structural weight of the building as a reaction force. Resistance piers are in-bearing piers that do not rely upon, nor require, skin friction to produce support. They are driven individually using the weight of the entire structure as a reaction during the installation. During the load transfer and restoration effort, hydraulic jacks are placed at multiple pier locations and pressurized simultaneously. 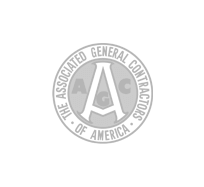 Therefore, creating the ability of the system to develop significant factors of safety. Ultimate capacity limits up to 115,000 lb. Proof test loads: up to 86,000 lb. another variety of helical underpinning, and there are multiple piles to choose from with varying capacities. 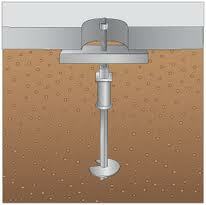 These piers provide support for failing slabs in areas such as garages, basements and patios. They are installed through a cored hole in the concrete slab and secured with a specifically designed slab support bracket that ensures effective permanent support of the structure. Helical Tiebacks are essentially helical piles serving in tension, and are very effective when addressing bowing walls, cracking walls and other problems with foundation walls. They screw horizontally into the soil mass on the opposite side of the wall where they generate capacity and secure the wall internally, similar to conventional concrete dead men. Remember, these are just some of the many solutions that we offer for residential foundation repair. 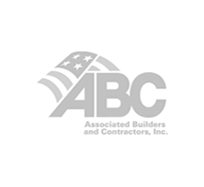 Contact the Atlas team for assistance on getting your foundation repair project started today!